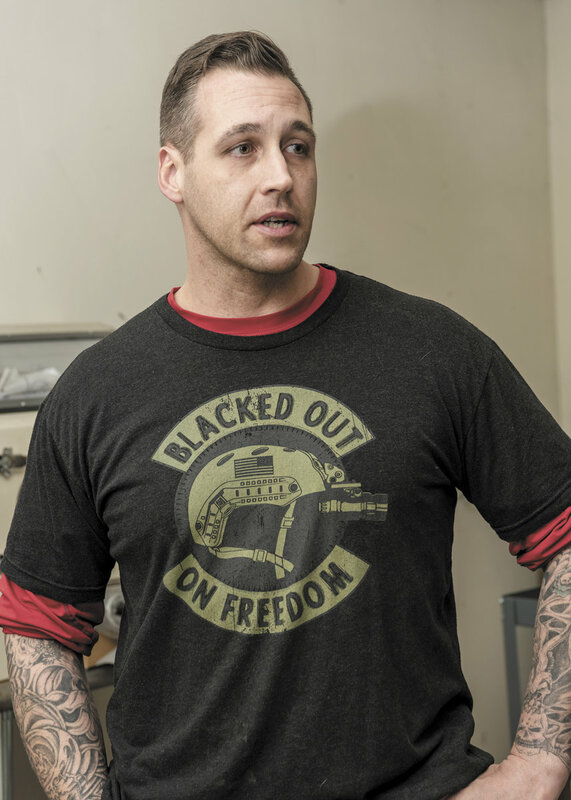 Nathan spent 11 years in the United States Army before answering his calling as a craftsman. He had been collecting knives for 20 years and after retiring from the army he thought he might revel in the creation process. Nathan is quick to admit that he knew nothing about forging knives prior to trying, despite his devotion to collecting them over the years. 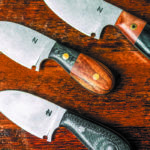 Over the past two and a half years, Nathan has set out to learn the craft of designing and creating knives all while amassing an impressive array of equipment to fill his little shop next to his family’s home. 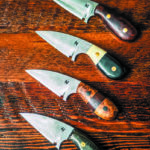 He is humble when talking about his lack of knowledge and skill, yet the knives he creates speak to his determination and inherent talent for the craft. Nathan explained that there are two ways to make a knife. 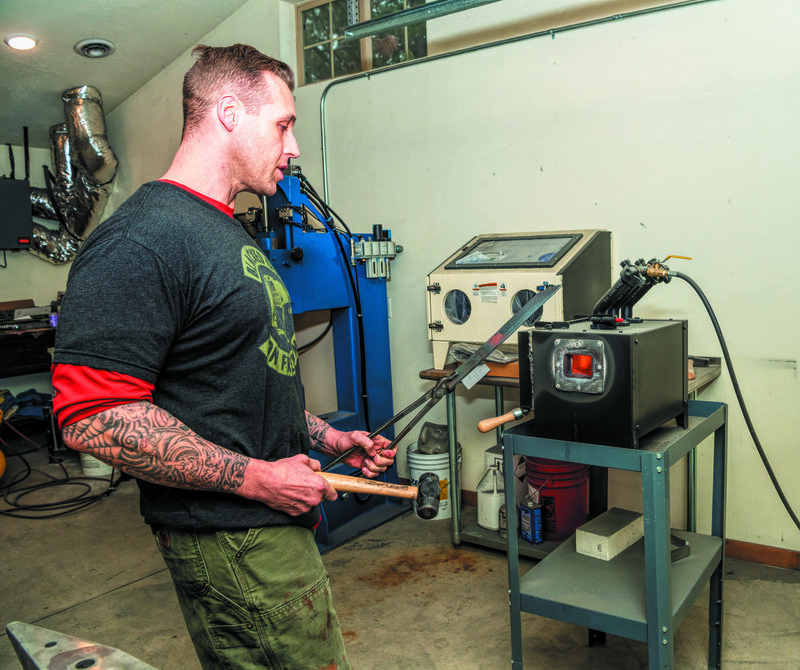 One is by forging, which is essentially heating up the metal and pounding it into the shape you choose. The other process is called stock removal. 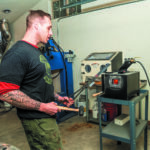 This entails starting with a piece of steel, then using a method to cut away what you do not want to keep. 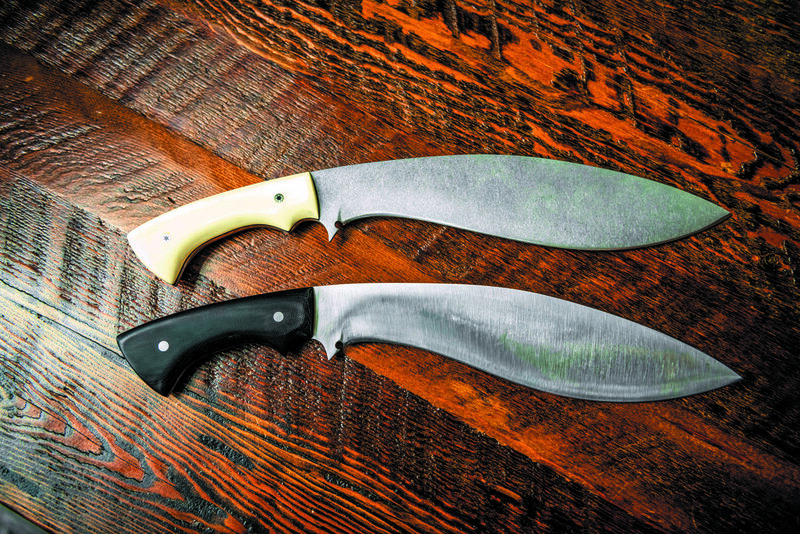 Nathan uses both methods and makes a variety of knives for different uses. The thinner the blade the better it is for slicing, much like a scalpel. On the other end of the spectrum are the chopping knives with a big, thick, robust edge. 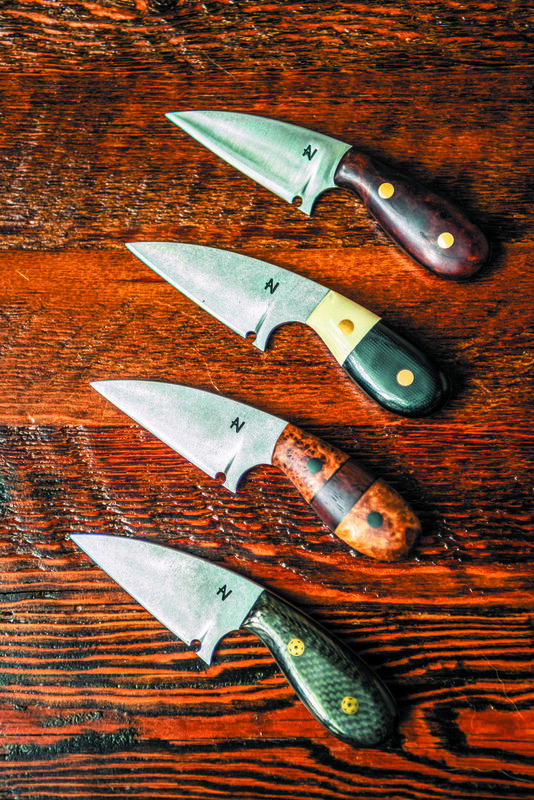 They are different in their creation and form, yet it is easy to recognize Nathan’s work as each knife combines a sleek curving piece of steel, a colorful wooden handle, and Nathan’s signature “N” stamped into every blade. 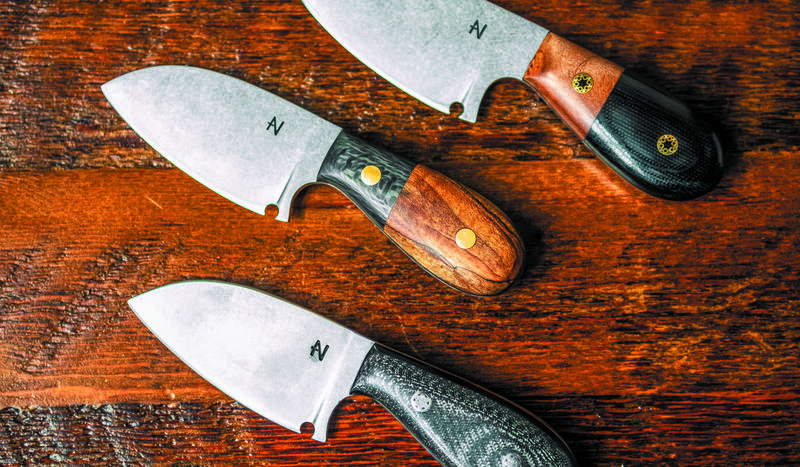 While it’s a labor of love for Nathan, Nathan Thomas Knives is indeed a family affair. He is quick to speak of his wife, Laura, as both the current bread winner in the family and his mentor in all things social media related. “That’s what taught me that I could build a business myself. My parents always worked for other people and I had always worked for other people. 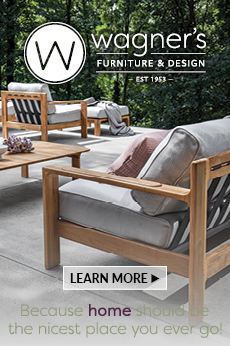 It wasn’t until I saw Laura [run her own business] that I realized you could start your own business and be your own boss,” said Nathan. She also taught him how to use Instagram, build a website, and have a Facebook page. Daughter, Bailey, and son, Noah, complete the Thomas family. 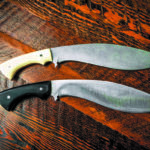 They are still too young to handle the numerous pieces of dangerous equipment in the shop, but Nathan hopes one day to teach them not only the skill of knife-making, but also impart to them the importance of learning a trade. “I grew up in front of a Super Nintendo,” said Nathan. “I want to teach my children skills, and that it’s never a bad thing to learn how to create something, even if it’s not what they want to spend their life doing.” Bailey is currently taking a shop class in school and her teacher showed Nathan how to weld. It is obvious that Bailey and Noah appreciate their parents’ efforts to be independent and never stop learning. Bailey expresses an interest in going into photography and Noah wants to make knives. Noah beams when showing off the knife gifted to him by his father, carefully removing it from its case and explaining how the minute flaws in the blade make it special for him. 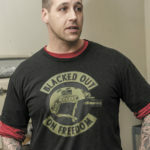 Nathan has sold a few knives and he hopes this will ultimately turn into a full-time business. 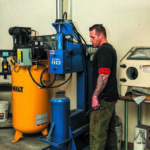 He is especially eager to learn more about his computer-controlled mill, which cuts the intricate pieces needed to make more than a fixed-blade knife. “I bought this and I just thought, you know, I’ll figure it out. 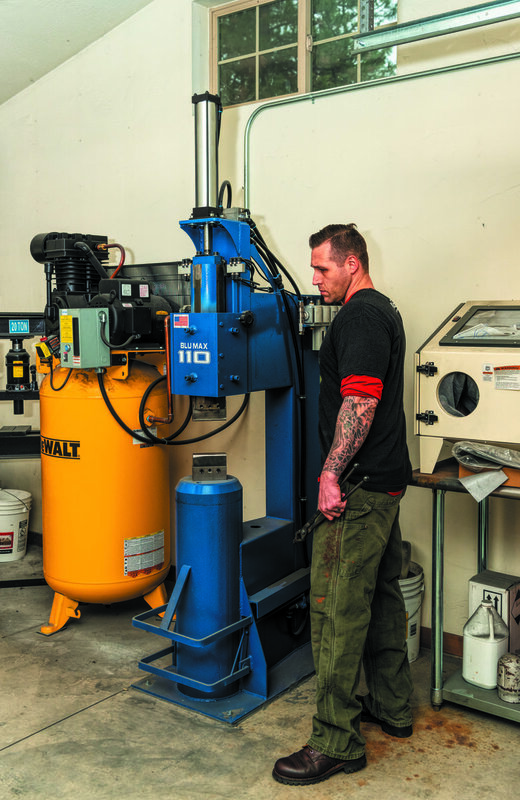 I went to a week-long class and all I learned is that I know nothing about machining.” He was very excited when Laura recently discovered that Missoula College offers a certificate in machine technology. “I’m going to college! I haven’t been to school in 22 years,” said Nathan. It’s a one-year program and thanks to his time in the army, he will be able to use the G.I. 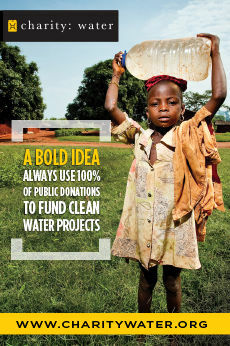 Bill to cover the cost. Nathan hopes that in a year or two he will be making drastically different knives. 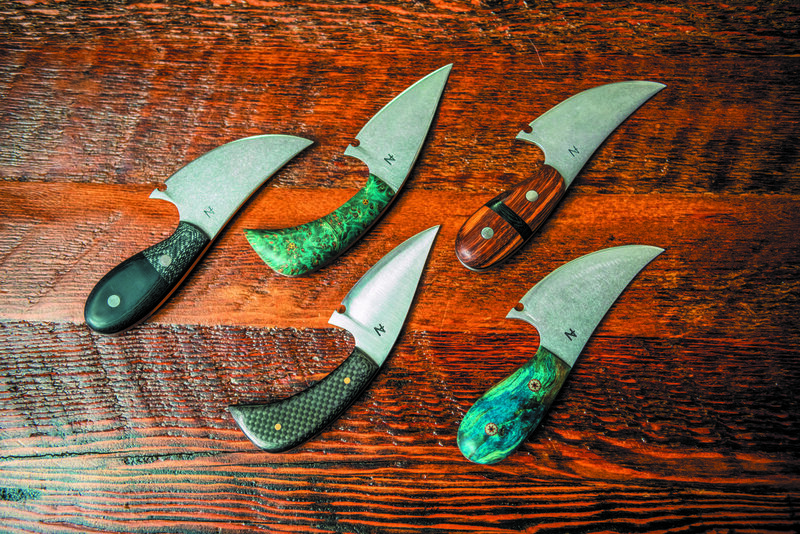 He eventually hopes to make complex pieces with mysterious names such as a balisong, damascus and san mai. 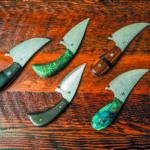 Nathan’s excitement and his ability to explain his process and impart his knowledge on a variety of knife designs proves that he will see nothing but success as he continues to hone his craft.